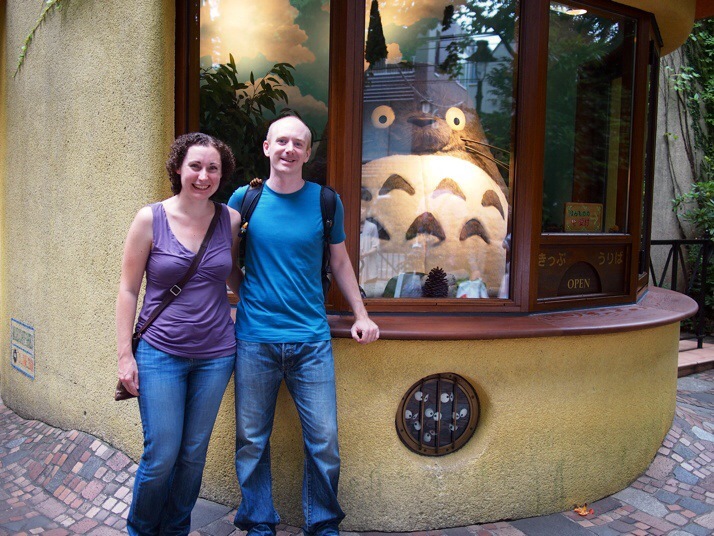 We spent almost 3 weeks in Tokyo (all of the time we had left on our 3 month entry stamp after our tour through central and southern Japan). It seems like that ought to be more than enough time to see everything, but before we arrived we had accumulated an immense list of places to see and things to do. Deciding that we didn’t want to be out from morning until night every day for 3 weeks, we pared the list down to about half its original size, leaving what we hoped would be a nice balance of different experiences. Here are some of my favourites. In stark contrast to the photojournalism, we also really enjoyed the exhibition ‘Presence or Absence’ showcasing the work of Japanese photographer Sato Tokihiro. He explores light in his art, which although quite different, reminds me now of James Turrell’s work that we saw on Naoshima. 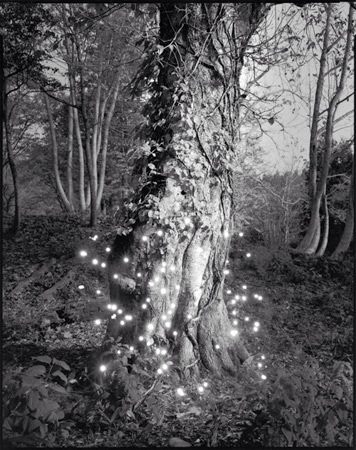 As well as images from pinhole cameras, he creates photos on a very long exposure with points or lines of light created by moving a flashlight (at night) or mirror reflecting sunlight (during the day) around in front of the lens. Knowing that much, it was interesting trying to work out how long an exposure would be required and how you would move to get the effect. I especially loved his images of trees. 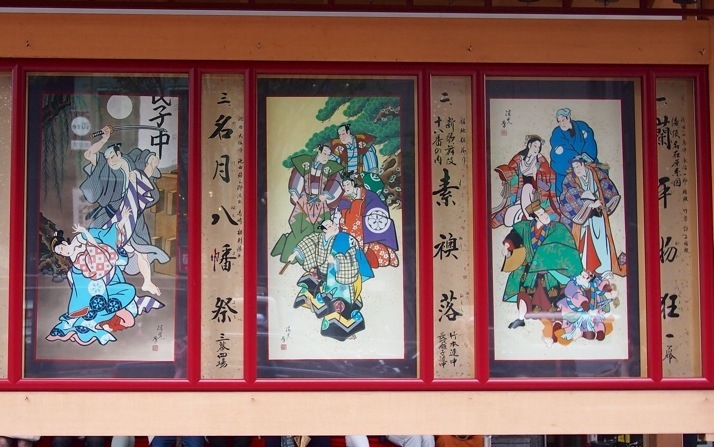 Kabuki is a style of traditional Japanese theatre. I really wanted to see a performance but was a bit skeptical about whether I would like, or understand, it. 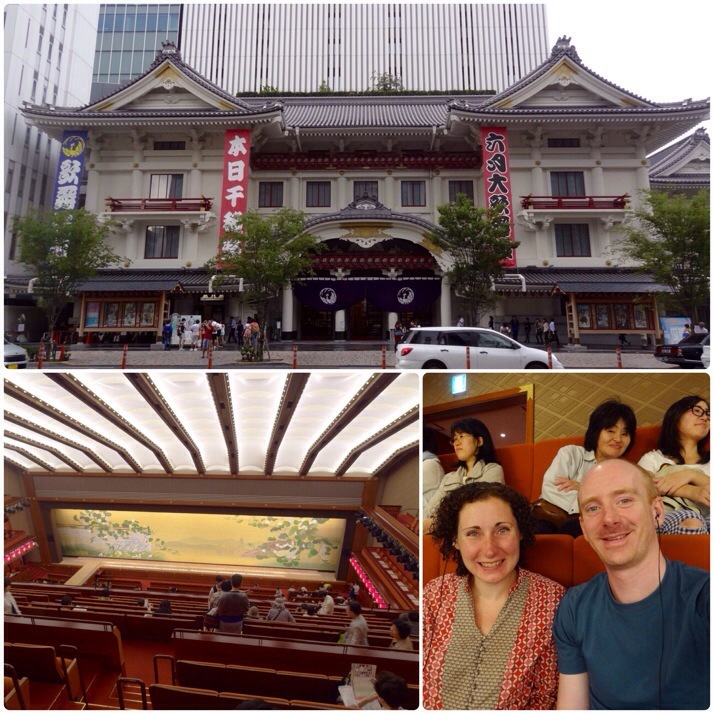 The Kabuki-za theatre in Tokyo allows you to buy same day tickets by the act which is a good way to get a taster without having to sit through (or at least pay for) a full 4 hour performance, typically 3 or 4 unrelated acts with intervals. We joined the queue outside the theatre an hour before the start of the matinee performance (and 30 minutes before tickets went on sale). It’s possible to buy tickets for consecutive acts and as the first one was only half an hour we paid for the second act too which was a more substantial 90 minutes. Inside we found seats at the front of the top tier and rented headsets which explained what was being said and the significance of some of the cultural references which would have been lost on us as non-Japanese. Although kabuki was developed by a woman in the early 17th century, the shogunate soon banned female actors from performing, worried about their delicate morals, and to this day both male and female parts are played by men. The acting style is quite melodramatic with the actors wearing magnificent costumes and thick white face paint, it incorporates dancing and there are onstage musicians too. The two acts that we saw were very different in content. The first was more or less an excuse for a long dance sequence with a very loose story tying it together whereas the second had a complicated and extremely far fetched plot with more twists and turns than an Agatha Christie novel. We were gripped although without the headphone explanations we would have been hopelessly lost! Not sure this one is strictly speaking a highlight but it definitely falls under the category of ‘memorable experience’. 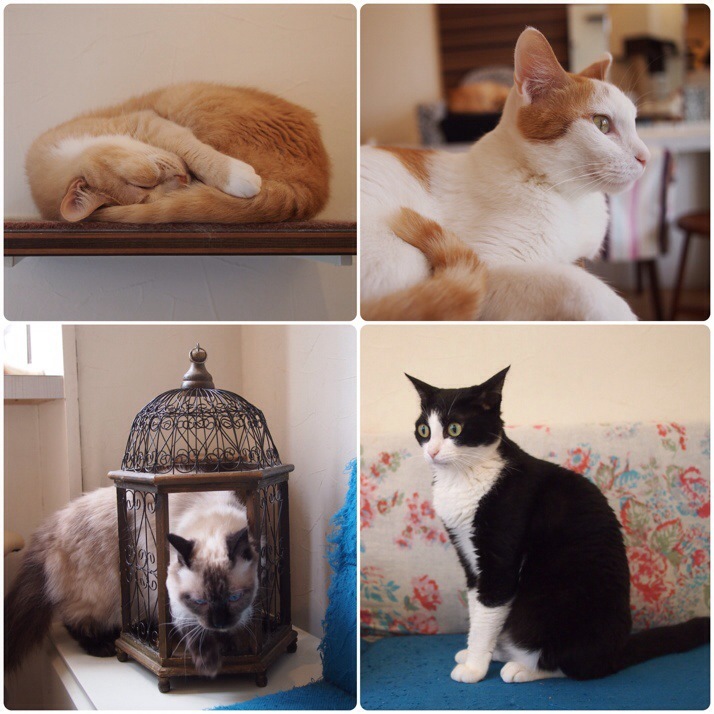 We’d heard about cat cafes before arriving in Japan and the concept was intriguing, a kind of short term ‘pet rental’. Nyafe Melange is just round the corner from the apartment where we were staying. 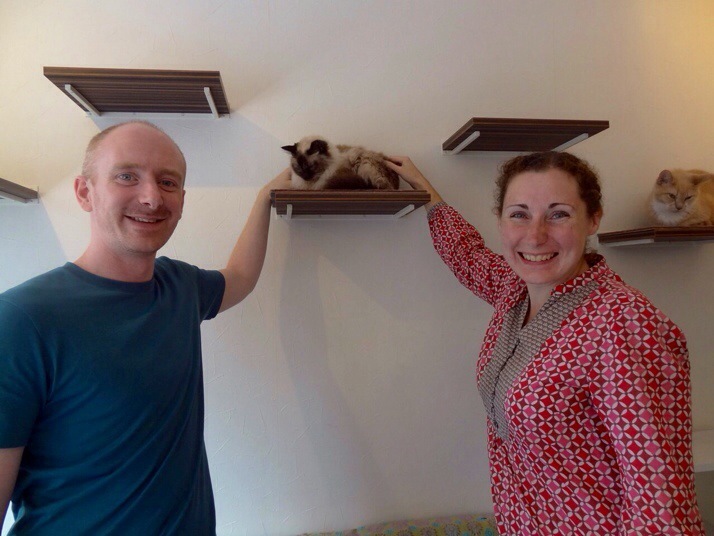 Cleanliness and welfare standards seemed to be high (we were required to wash and disinfect our hands before entering the cat room) although, perhaps inevitably, most of the furniture had scratch marks. 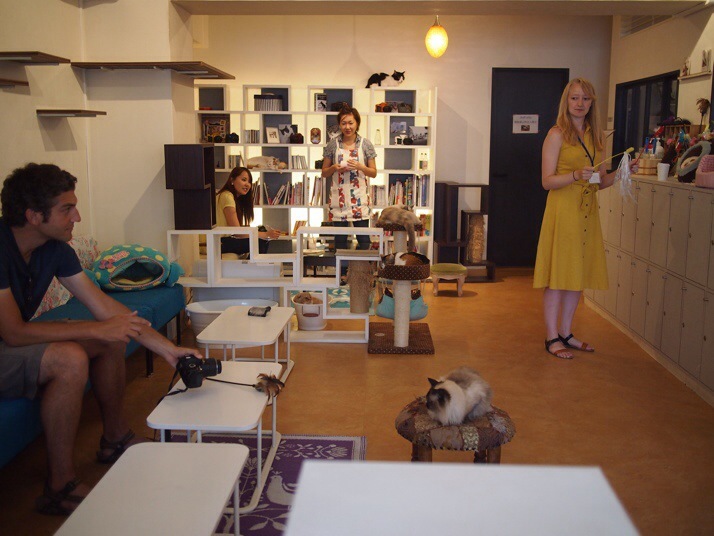 It was kind of like sitting in the living room of the house of someone with a lot of cats, except that the cats weren’t as interactive or playful as we’d expected, most were sleeping on small shelves on the wall or in the sun on the windowsill, but the young woman running the shop was friendly, handing us cats and telling us their names. She even managed to coax a couple of them into chasing one of the toys. 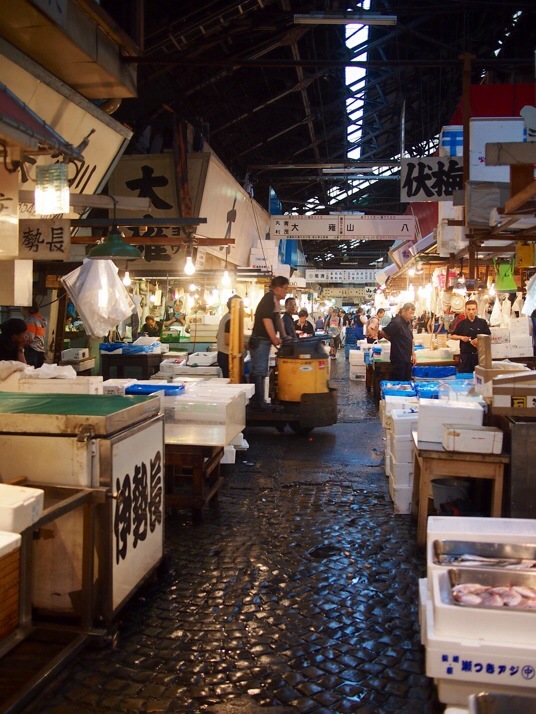 Tsukiji is the world’s largest fish and seafood market. 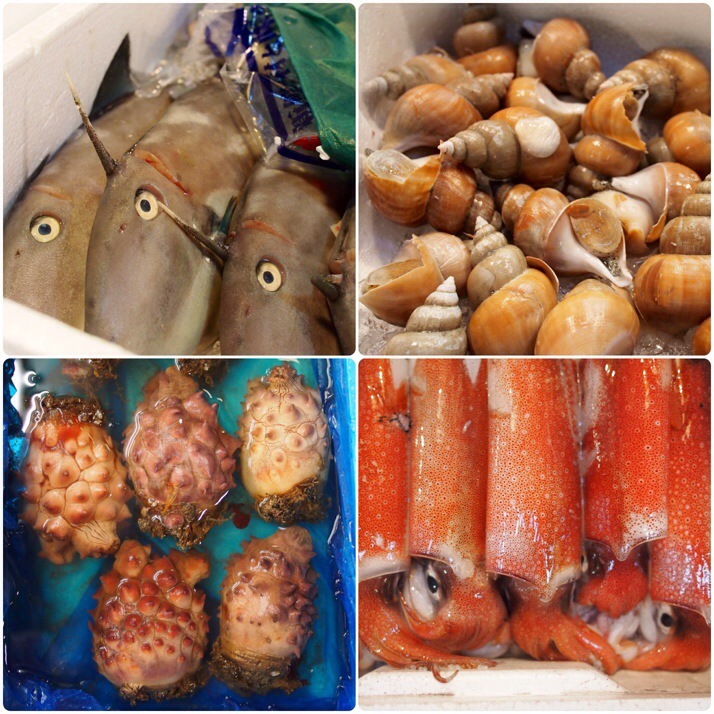 According to the Lonely Planet, a mind-boggling 2400 tonnes of seafood a day are moved through it. It’s possible to visit the famous early morning tuna auctions here but having done a bit of research it seemed like they are extremely tight on the rules and as entry is on a first come first served basis you need to start queuing from around 4am which is before the public transport starts running. 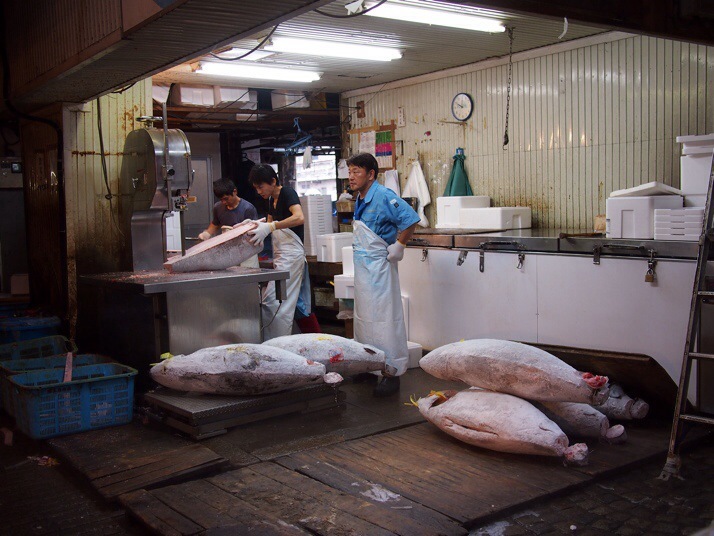 Given all that and the fact that we’d seen the fish auctions during our market tour in Kagoshima we decided to give the auctions here a miss and just look around the wholesaler’s area which is open to the public from 9am. It is vast. Just stall after stall of weird and wonderful fish and sea creatures. We wandered along one of the aisles trying not to get in the way and wondering if we would ever reach the back wall. Eventually we did and it was well worth it because there we found an area where four fishmongers were processing enormous frozen tunas, trimming and quartering them using a massive band saw. We watched, enthralled, for about 10 minutes. The site holds more than just fish, there’s also a large area for fruit and veg wholesalers and various supporting businesses selling everything from handmade Japanese knives (if we were coming straight home I would definitely have had one of those) to scales to wellington boots, with a healthy dose of souvenir shops sprinkled amongst them. 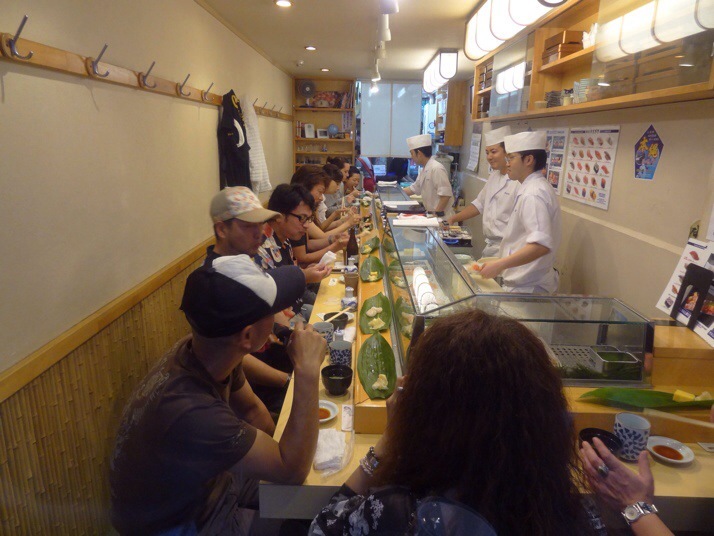 Of course the morning ended with a sushi lunch at one of the on-site restaurants. They’re all quite small (say 12-15 seats) and the queue for some of them was about 40 people long! As we were hungry and it was raining we went against our usual advice and chose the one with the shortest queue. It’s a good job we did, because we still had to wait for more than half an hour to be seated, but it was definitely worth it! Studio Ghibli (pronounced “jiburi”) is a Japanese animation studio which has been producing films since 1985. 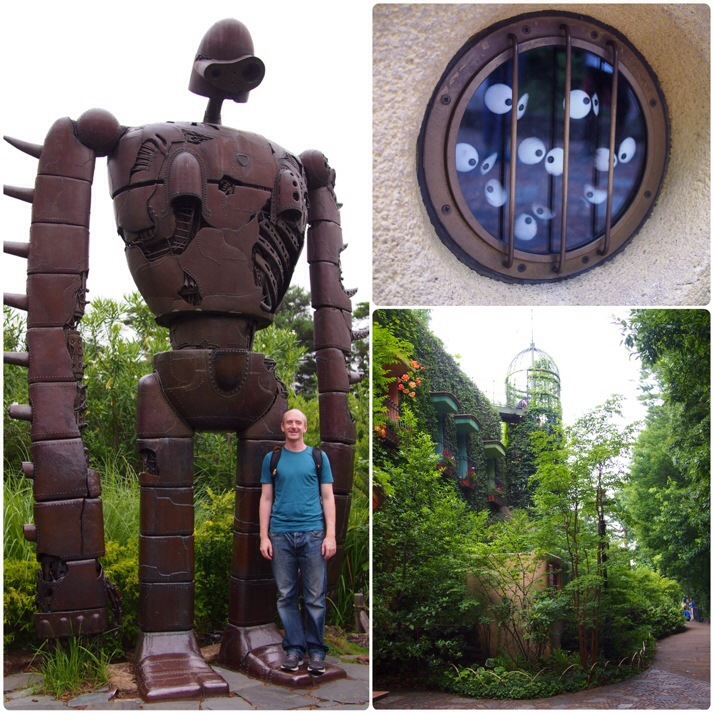 It’s not strictly necessary to know anything about the films before visiting the Ghibli Museum but we watched four of them in advance and were very glad we did as it put us in the right frame of mind. The museum is primarily aimed at children but there are plenty of magical things to keep big kids interested too. One of our favourites was the section on the first floor called “Where a Film is Born”, a series of rooms set up as animator’s studios packed with inspirational bits and pieces and with walls covered with artwork from the films. In a different area there was a spinning carousel which worked a little like a 3D flipbook (the fancy name is a 3D zoetrope) with character models in different poses and a strobe light to create the pauses. 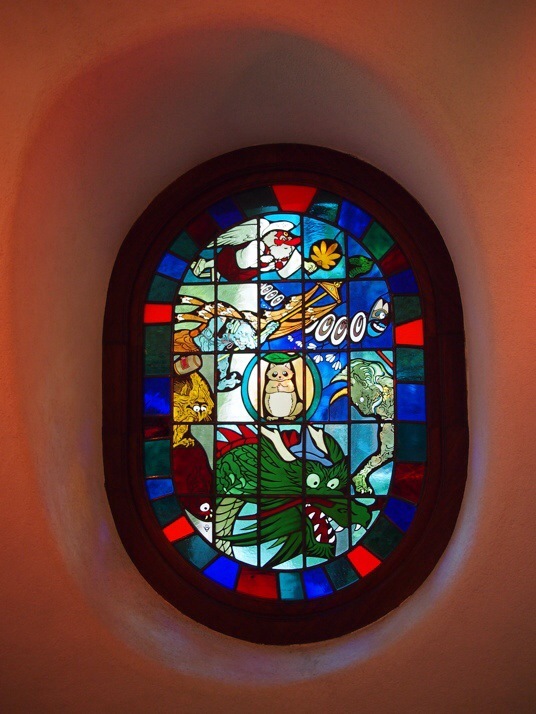 Many of the museum’s windows contain stained glass decorated with characters from the films. There is a small cinema onsite showing a 20 minute short which is exclusive to the museum. We saw ‘Looking for a Home’ which like many of Ghibli’s films features an independent and capable female protagonist. A girl packs her backpack with an unfeasibly large number of apples which she gifts to shrines, gods and animals along the way as she heads into the countryside for a camping trip. 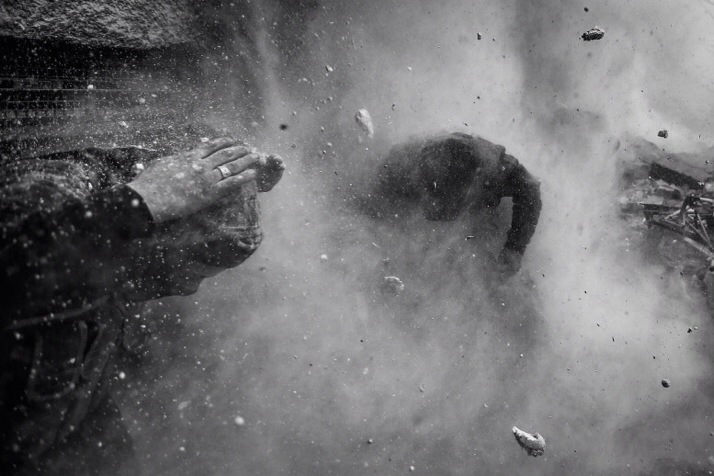 There was no spoken language in the film so it was easy to follow for everyone with just sound effects, it reminded me of the fantastic Pixar shorts which are shown before their feature films. 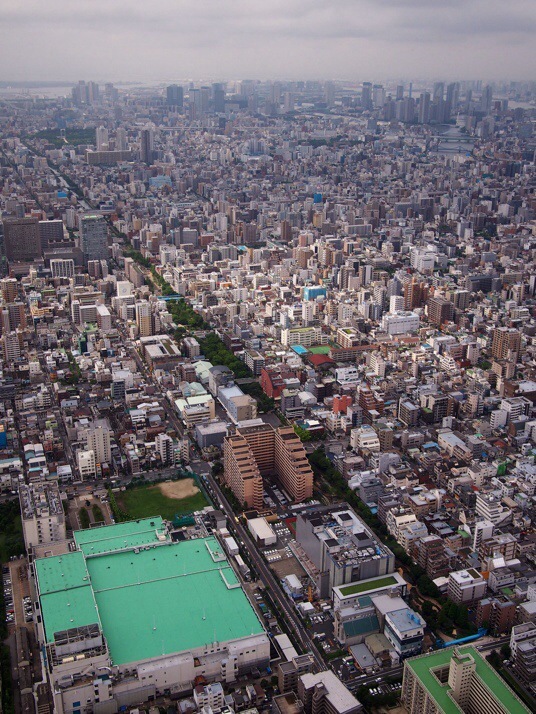 Tokyo’s TV and radio broadcasts used to be all transmitted by Tokyo Tower, a bright red Eiffel Tower lookalike, but as Tokyo’s urban environment got higher and higher it was realised that a taller structure was needed to send signals above the skyscrapers. 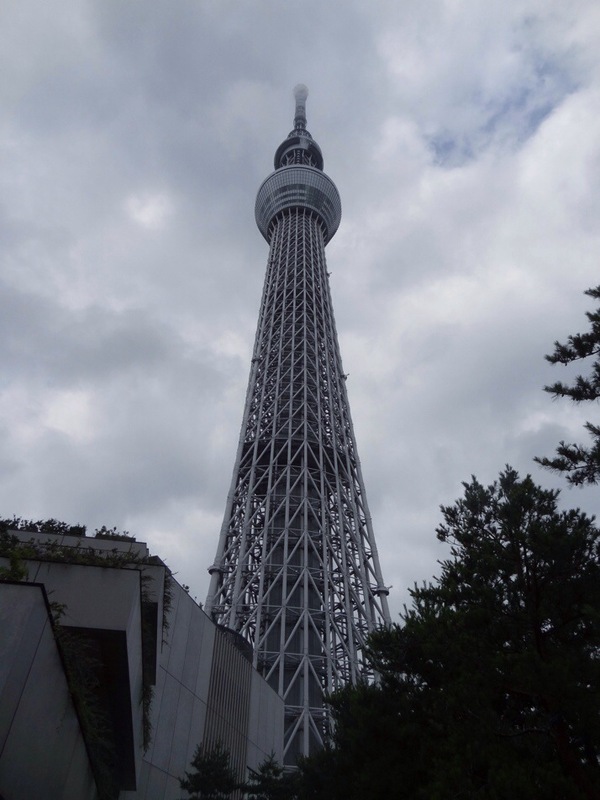 And so Tokyo Skytree was born. When it opened in May 2012 it was the world’s tallest ‘free standing communication tower’ at 634m. And is still the world’s second tallest structure after the Burj Khalifa in Dubai. Judging by the miles of space cordoned off in the lobby they must expect a lot of visitors but it all looked rather comical at 9am as we walked straight through to the ticket desk past about six ladies in immaculate uniforms telling us ‘this way’ with not another tourist in sight. 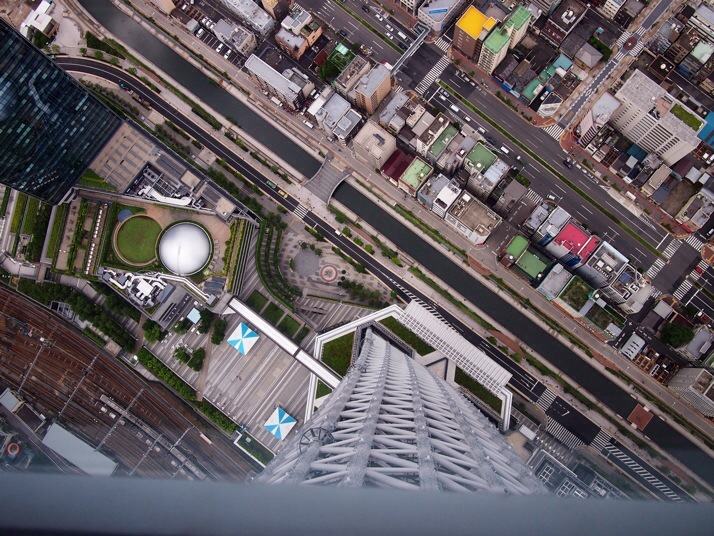 We ascended to the first viewing platform at 350m at the rather dizzying speed of 600m/min (over 22mph) – even faster than the lifts in the Petronas Towers in Kuala Lumpur. 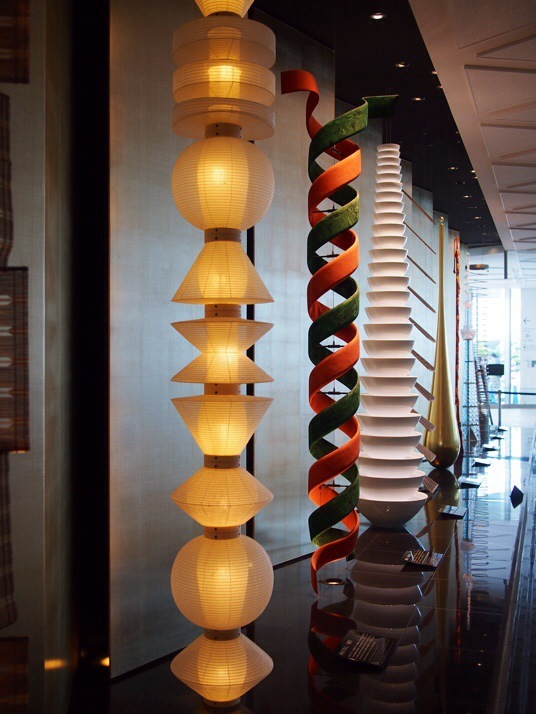 There’s a nice exhibit of Skytree models in the lobby, each made using a traditional Japanese craft method and embodying a facet of the design, e.g. Shinbashira vibration- control system based on ancient architectural techniques using bamboo and symbolised with a model made in bamboo craft – nifty, no? As you’d expect the view from the observation deck is pretty spectacular. It’s said that you can see for over 70km on a clear day including a view of Mt Fuji. Unfortunately, it rained pretty much every day we were in Tokyo so I’m not sure that June and July are the right time of year to see that far. Just before the lift back to the lobby there’s a section of glass floor from where you can see straight down the tower to the streets below. It doesn’t look too bad until you notice the size of the lorries on the street in the upper right. 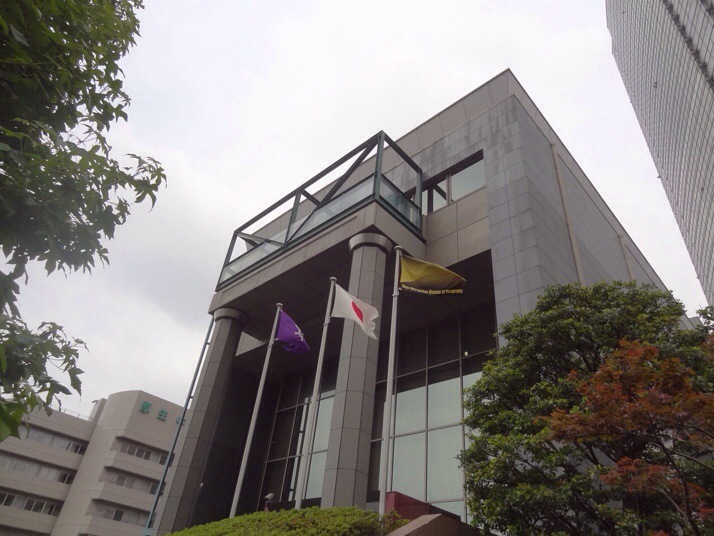 This entry was posted in Places and tagged Japan, Tokyo on July 12, 2014 by Julie. What is 34 + 18 ?